Campbell has a lot going for it. It is in the heart of the Silicon Valley action, it’s near mountains and beaches, and the people are friendly and outgoing. More than that, there is true beauty in our town. And, Instagram is there no matter where you go to capture that beauty. Here are our favorite, most Instagrammable spots in Campbell. Los Gatos Creek Trail is just one example of the natural beauty in Campbell. Home to all kinds of beautiful wildlife, the trail is a perfect place to catch some truly awe-inspiring shots. Whether it is a cotton candy sunset, a graceful heron, or a majestic hawk, you’re sure to find plenty of amazing pictures to fill your feed. Honestly, what’s cooler than a water tower? For years, something has drawn us to pictures of these giant water balloons in the sky. And now, with modern outdoor lighting technology, they can provide an intriguing symbol of the city. In Campbell, the town name is emblazoned across the middle of the iconic water tower, so a photo can show your hometown pride as well! Farmers’ Markets are a time for a town to come together to appreciate the handiwork of your neighbors and the bounty of the local farms. From fresh produce to handcrafted artworks to delicious meals and live music, the Campbell Farmers’ Market is a great place to find some shots for your ‘Gram. 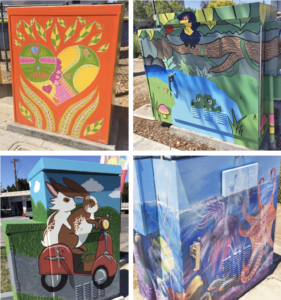 Back in 2016, the city of Campbell undertook a project to make sure the power boxes all over town weren’t such an eyesore. They commissioned local artists to paint the plain boxes with bright designs to turn a boring, everyday object into a work of art. The boxes are located all over town, and you can have an Insta-scavenger hunt to capture them all! Locations of all the painted boxes are available at https://goo.gl/ttQ6AP. The Heritage Theater is an iconic Campbell building that facilitates many different types of events. It plays host to everything from ballet to art shows to American citizenship ceremonies. And what’s more, it’s an absolutely beautiful building. Built in 1938 as the Campbell Union High School Auditorium, the theater is now a cherished landmark of the Campbell community.